Gary Hume is a British painter and sculptor who graduated from the renowned Goldsmith’s College of Art and was part of the famed Freeze exhibition of the late 1980s organized by Damian Hirst that featured a group who became known around the world as the (YBA) Young British Artists. 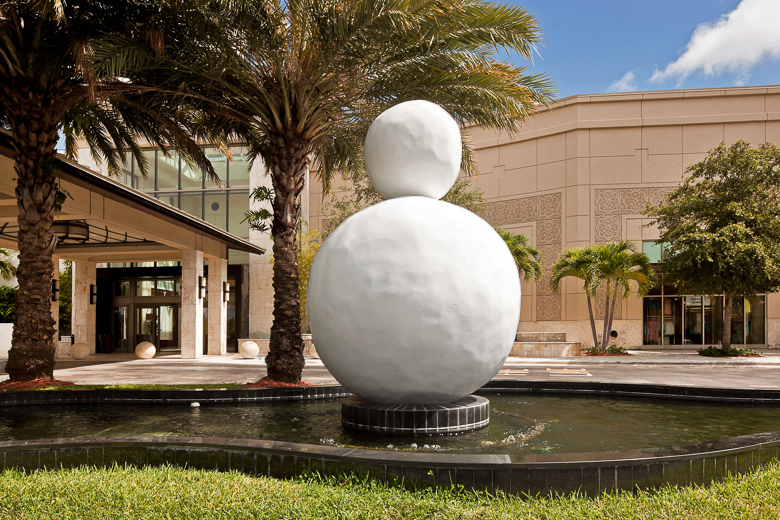 The 10-foot-tall, half-ton, faceless snowman stands outdoors amid palm trees. Abstract and figural at the same time, the snowman provides a witty commentary on the state of sculpture, modernism, and Pop art. Hume has described the snowman as “the perfect sculpture, viewable from all sides, immaculate from all angles.” Back of a Snowman was exhibited at London’s Royal Academy, the Irish Museum of Art, Germany’s Kunsthaus Bregenz, and New York’s Battery Park City.